battles is worth more than just a win or a loss. Last season Dorman led the Bellevue high school girls’ varsity team to the 3A state semifinals with an 18­2­0 record. 1941 the NSCAA has grown into the world’s largest soccer coaches’ organization. 30 years of age across all levels coaching in the United States. Last year Dorman received the NSCAA North West Region High School Coach of the Year award. equivalent of ‘state,’ until playing Rugby at the University of Birmingham. and go. Can we go 15­0? If none of our players graduate what would be the point?” he said. 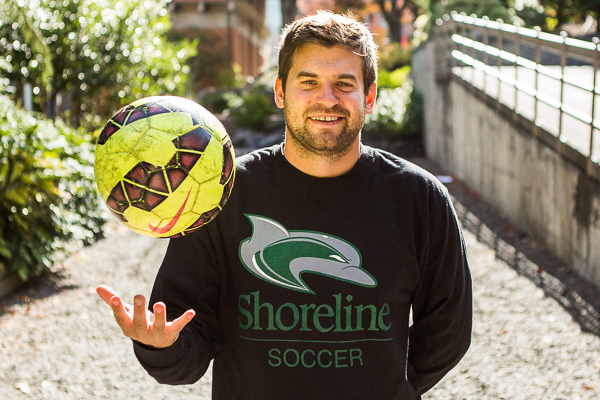 NWAC Final Four, but simply winning is not what the coaching role is about for Matt Dorman.